It was nearly a year and a half ago, on a cold and wintry day, that I stumbled across a big building site in the very heart of Soho, where the streets are small and windy, and it’s very easy to lose your way. From the corner of my eye I spotted the give-away Firmdale Hotels logo; the undressed mannequin. On further inspection a small notice told me that the site was being developed and planned to open in 2015, enough to get me very excited. Now, nearly 14 months later, a derelict industrial wasteland has been transformed into a sparkling piece of urban regeneration. 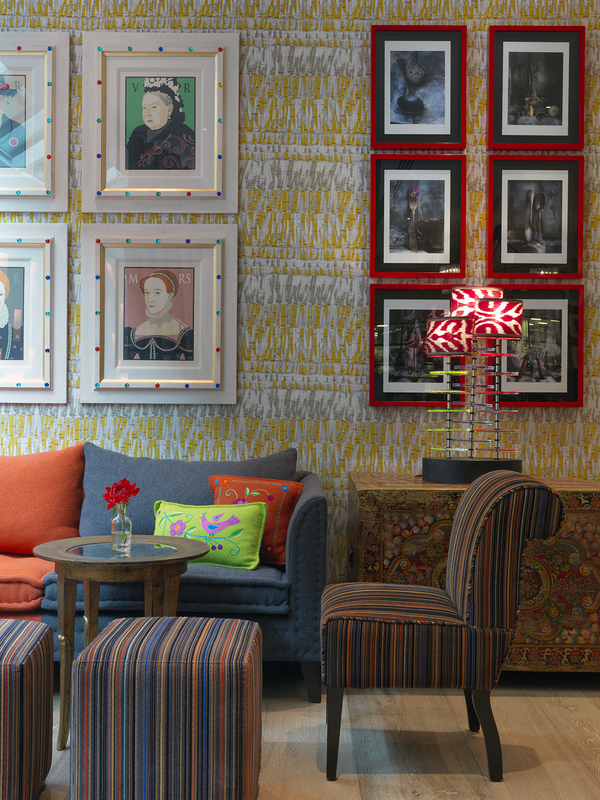 The mark of a good hotel, I always think, is that it transforms its environment, for those who live, work and play there, for the better – which is certainly the case for Soho dwellers since Ham Yard opened its glass doors. One of the major perks of my job is that I get to visit a lot of hotels, all over the world. 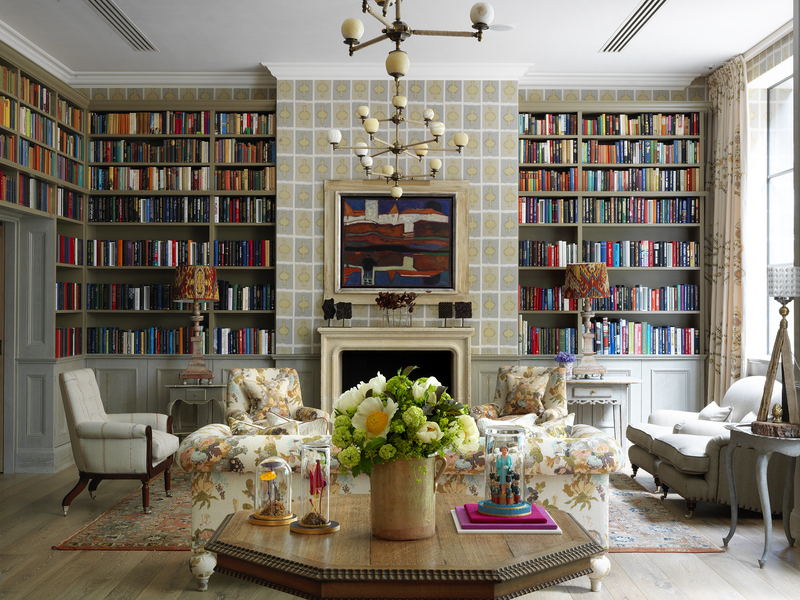 And yet it’s not often that I stumble across one that really makes me go ‘wow.’ Of course, (nearly) all luxury hotels are lovely in their own way, but there are those that really stand out from the crowd, Ham Yard being one. One of just three (so far) in my mini series, this is a hotel that utterly deserves its own post, despite having been open for barely a month. Those interested in hotels / art / design / boutique hotels / London will be well versed in the story of Tim & Kit Kemp. 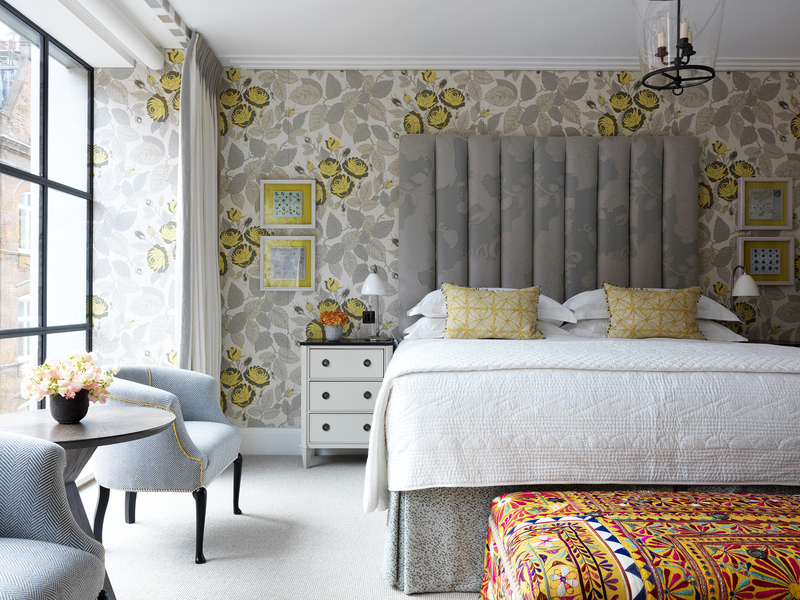 A husband and wife duo, this power couple have completely transformed the London hotel scene. It’s unheard of for a company (even a mega-brand like a Hyatt or Marriot… yawn) to have eight (yes, eight) hotels in the same city. However, Firmdale, with their inimitable formula of unique design, service that cares, effortlessly cool bars and restaurants and bucket loads of character, have pulled it off. So, fresh from its launch, and already up there with my favourite hotels, I bring you the top ten things to love at Ham Yard hotel. Anyone who has tried before me will know that it’s practically impossible to describe Kit Kemp’s signature and unique style (some call it ‘English Eccentric’, but I think it’s so much more than that). 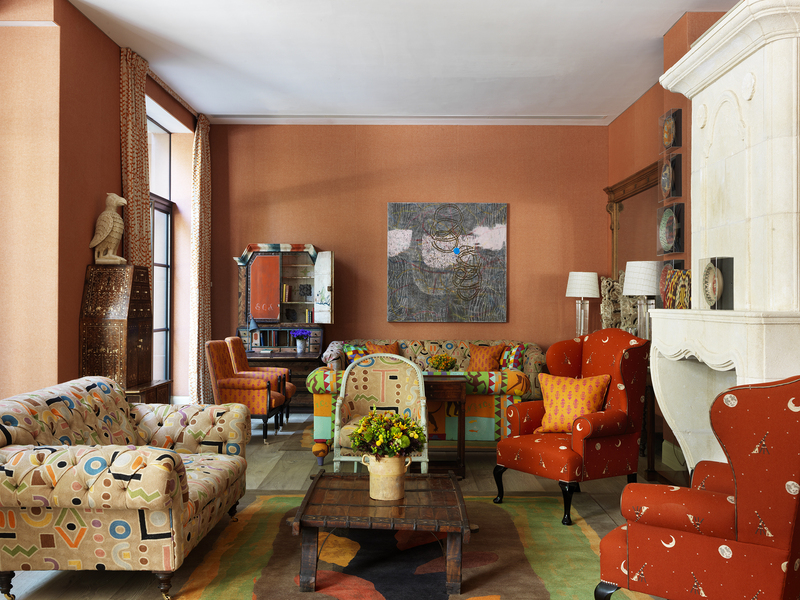 Although always made up to one-of-a-kind pieces and prints, you can spot a Kemp-designed space from a mile away. Her creations always feel so well thought out, so warm, loved and lived in. The contrasting colours, mad patterns, shapes and styles shouldn’t work, but, due to Kemp’s expert eye, and innate feel, they always do. And, what’s even more impressive, is that at Ham Yard, like at all Firmdale hotels, all the rooms (and bedrooms) are actually unique – there are no cookie cutter styles or boring reoccurring themes. As a keen Indophile (as readers of my other posts will know) I was delighted to find reoccurring Indian block prints, rich textiles and Mughal-esque miniature paintings dotted around the property. And then there are the signature Kemp-designed wall fabrics (made in conjunction with Christopher Farr), lamps made out of plastic bottles, tables that, on closer inspection, appear to be sheep, a moving clock and a pop-art take on Britain’s four queens. A sense of fun is everywhere at Ham Yard, and it’s infectious. The rooftop bar has become an almost must-have feature of any hotel that opens in a city these days (here are some of my favourite worldwide), and for good reason too; they offer guests killer views, an outside space for smoking and a really good place to host unforgettable parties. 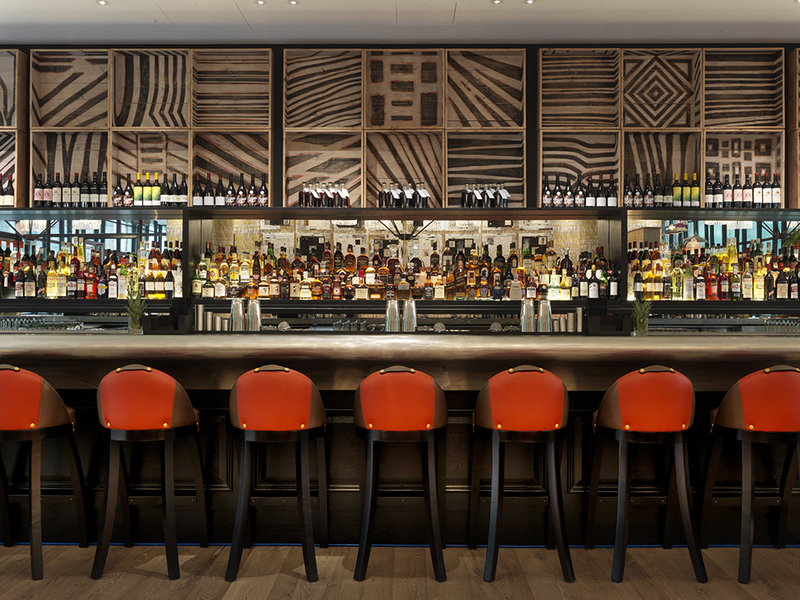 Being Firmdale, at Ham Yard they’ve taken this tried-and-tested concept one step further. Yes, they have a roof terrace. But, this roof terrace has: a grand piano that doubles up as an open icebox (yes really), a pair of delightful olive trees and its own vegetable and herb garden (of course). There’s also cane outdoor furniture with crisp white cushions (very Club 55 meets the city), a covered area decorated with hanging lights (should the heavens open, it is London after all) and cooler-than-cool views over Soho beyond. This is the kind of venue that inspires you to host a party, even if you don’t have a reason to (normally the best kind). 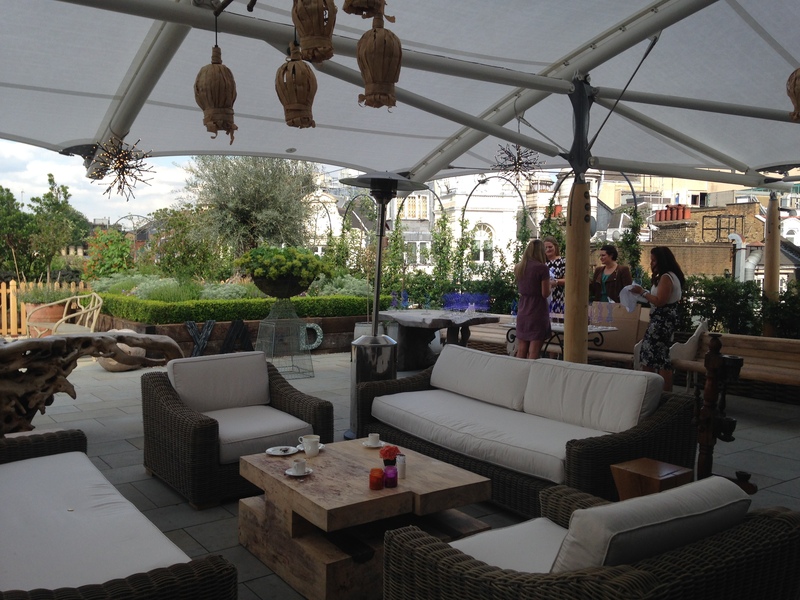 To avoid disappointment, it’s worth knowing that the rooftop bar is only open to hotel guests and private functions. Boo! Better get yourself an invite sharpish. I say bowling alley, you think a leisure centre in Watford, those horrible shoes and really bad food. Not any more. 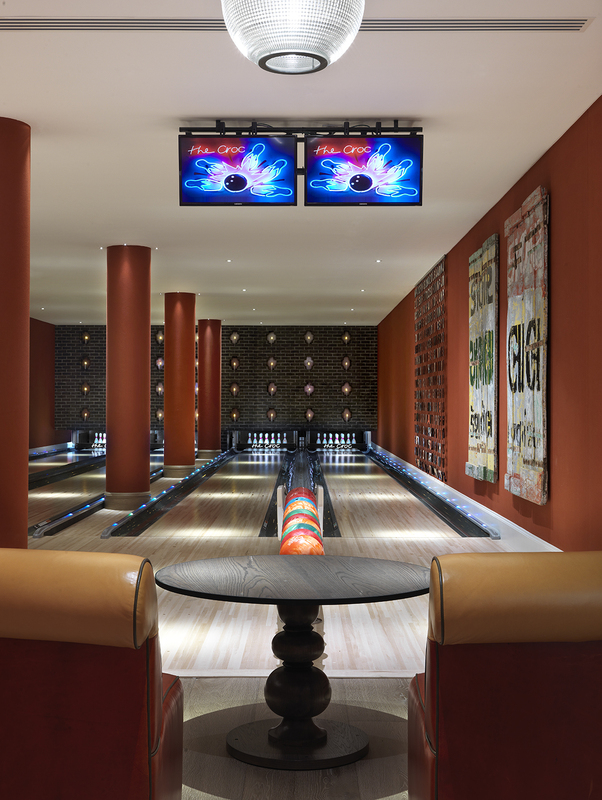 Ham Yard has dedicated two below-level floors to event space, my favourite of which is the American-inspired Croc Bowling Alley (the rest includes a dance floor, lounge bar, theatre and beautiful meeting rooms). An original 1950s bowling alley, created by Brunswick and imported from Texas no less, it has original maple floors, hand warmers, vintage bowling shoes and lovely squishy sofas. Play a game or two, tuck into delicious snacks, wash them down with inventive cocktails, then party or sing karaoke next door on the dance floor where crocodiles hang off a wall decorated with 3D butterflies (the work of Christian Lacroix’s wallpaper collection) – no I’m not joking. It sounds mad, and over the top, and if it shouldn’t work, but it does. And just so well. If you don’t believe me, just try booking a lane for your office Christmas party. They’re already sold out for the month of December. Right next door to the bowling alley you’ll find the hotel’s Dive Bar and state-of-the-art 176 seat theatre. I don’t know many hotels that have their own theatre, but then again Firmdale don’t do things like most. The theatre has been designed for professional productions and film screenings, and is pretty hard to forget with its deep orange seats and striking blue walls. The perfect place to feed and water the guests at functions being held can be found just next door. The Dive Bar owes its name to the neon lit sign of a diving lady plunging down into the hedonism below her (in addition to an enormous orange juice presser). With its endless ceilings, candy-striped arm chairs and zig-zag print walls, this is the place to hire for a private show, party, production… and a really good time. As with the rooftop bar, it’s only possible to visit the theatre and Dive Bar with an invitation or if you are looking for an exclusive use venue. An especially smug play on words, at Ham Yard, as with the other London Firmdale hotels, you’ll find a Soholistic Spa. Designed with a beach in mind, this isn’t the biggest spa you’ll find in London, or the glitziest, but it’s a great little place to relax and unwind, especially after all that bowling. A wacky relaxation room and Kit Kemp’s deliciously fresh Rik Rak products (I’m not saying I loved the smell of the Orange Blossom & Gardenia hand-wash, but I didn’t want to shower the next morning and lose that gorgeous smell) all make this a great spot for a massage, but the spa’s real piece de résistance is the Hypoxic Chamber (which sounds straight out of Harry Potter to me). What was this, I enquired while being shown around. It’s a room which simulates training at high altitude with limited amounts of oxygen. Well yes, of course! This will be pretty useful if you’re training to climb Everest or you’re a professional footballer but otherwise it’s just fun to say that you’re staying in a hotel that has a Hypoxic Chamber. One of Ham Yard’s most interesting features is that the outdoor courtyard, through which you enter the hotel site, is actually a public thoroughfare. Until now, luxury hotels have prized themselves on exclusivity; who is allowed in, who can afford to stay etc. etc. You only have to think of the Chiltern Firehouse (which is harder to get into than … the hardest thing you can imagine to get into) as a recent example of this (don’t worry, I managed to get in). 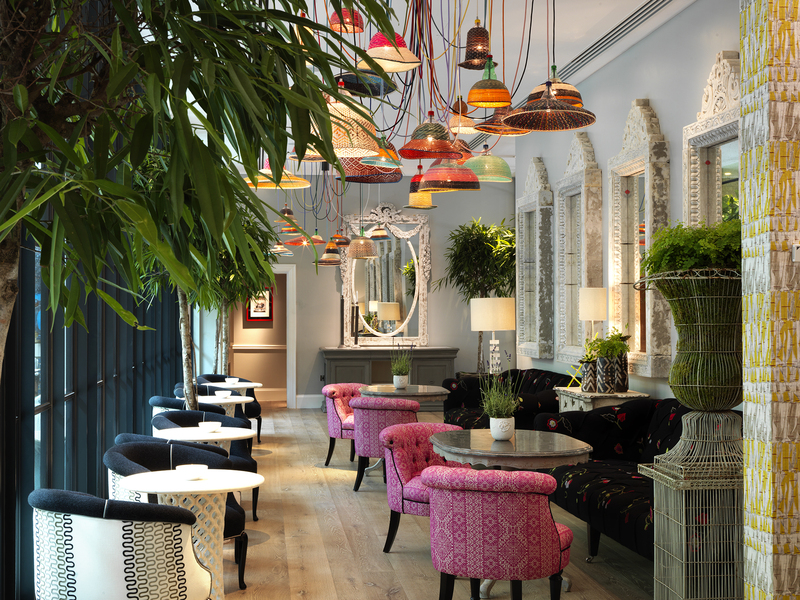 Ham Yard, in true Firmdale style, has turned this concept on its head. Anyone and everyone is welcome, and actually encouraged. 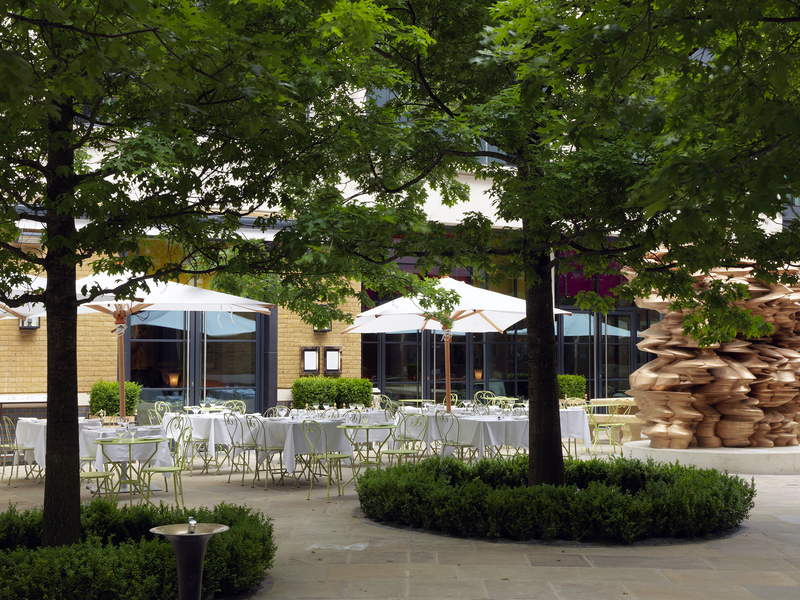 The effect this has is that the hotel’s courtyard is a working space where real people walk, shop and talk and admire Tony Cragg’s bronze sculpture. The hotel belongs to its environment, and those that live, work and play in the area, are definitely making the most of it. On a summer’s evening, with al fresco diners and drinkers, I could have been in Seville, in Avignon, in Florence; the cobbled streets, the white tablecloths, the care-free laughter – all a million miles away from the slightly shady, definitely dodgy, Soho of just a few years ago. Of all the spaces being used in the hotel each time that I’ve popped by, none have been as popular as the restaurant and bar, and it’s not hard to see why. Filling practically the entire ground floor (with the exception of the Drawing Room and the Library – both warm and colourful spaces and the perfect place to while away an afternoon), the restaurant and bar manifests itself in lots of different nooks and crannies; which all just adds to the charm. You can have bar snacks in Moroccan-themed Orangerie, under the glass roof, on sofas in cosy little corners, dine at one of the banquettes or the many tables outdoors or sit at the bar. I loved the friendly and welcoming staff, the fun and festive cocktails (which feels like quite a feat in 2014), the delicious bar snacks all priced at £5 (my gal pal Katie and I especially loved the truffle-oil infused ham & cheese melt), the inviting glow of Martha Freud’s candle-lit alcoves, the exquisite wall fabrics (of course) and the buzz of the place – people eating and drinking, enjoying their environment and just having a really great time. I’ll be heading back in a couple of weeks to try the hotel’s incredibly good value Afternoon Tea, and will be sure to keep you posted. But if it’s anything like the tea I had at The Haymarket or Dorset Square Hotel with the same group of girlfriends, I don’t think I’ll be disappointed. I first went to Ham Yard for their opening party. It was about a week after they had officially opened the doors, a time when most hotels still have men with hard hats walking around, and plastic sheeting lining the floor. Something felt strange. And then I realised what it was. There were people everywhere. And not just PR people, and hotel people, but real people, having fun, using the spaces as they were designed to be used. The second time I went, a few weeks later, it was even busier. For a hotel to have embedded in its environment so quickly is almost unheard of. And yet, as many hotels have learnt the hard way, it is what makes or breaks a property; when guests feel that a city’s cool crowd want to go to a hotel, be seen it in, have fun in it, then they follow. Firmdale’s stellar reputation and incredibly loyal fan-base has made Ham Yard a cult hotel, even less than a month after it’s opening. Rather impressive stuff. Taking over the from the Soho Hotel (one of my top ten places to go on a hot date), Ham Yard has become Firmdale’s flagship property. It’s not rocket science to see why; the space, the size, the courtyard, but most importantly, the location. It’s almost impossible to believe that, in a global city like London, where real estate is always in demand, prior to the acquisition by Firmdale, the site was actually derelict. Smack bang in the middle of Soho, and a short walk from Piccadilly Circus, Oxford Circus, Regent Street and Wardour Street, this is where you really want to stay on a trip to London; theatres, bars, restaurants, clubs and shops, that real Londoners frequent, are all on your doorstep. Designed as an ‘urban village’ (a phrase that would sound a little bit naff, if it wasn’t completely on the money), the site is home to an array of independent shops; there’s Frescobol Carioca, (the Rio equivalent of Vilebrequin) a quaint little tea shop and an upmarket florist (Bloomsbury Flowers) is about to open. This only serves to give the site more character, and make it even more of a destination. Killer hotel location translates to killer views. One of the things I loved most about the rooms at Ham Yard is their views. Ok, so they don’t boast the insanely glitzy panoramics of the Corinthia, or the bird’s eye views from the Shard, but they show a side of London that I’d never seen before and so, in turn, felt new and fresh. Floor to ceiling windows open up to chimney-stacks and inner city views, all charming and a stark reminder that you are right in the middle of the action. As those who have stayed at a Firmdale property will know, all their rooms have those little things that other hotels don’t quite seem to get: amazing hairdryers that plug in next to floor length mirrors, mini-bars that come with jellybeans, coconut water and scented candles, and beds that eat you up and almost cuddle you to sleep. Ham Yard has gone one step further and so rooms have humungous state of the art flat screen televisions that come with fancy touch screen remotes; draw out a number four with your finger and channel 4 will pop up on the screen. 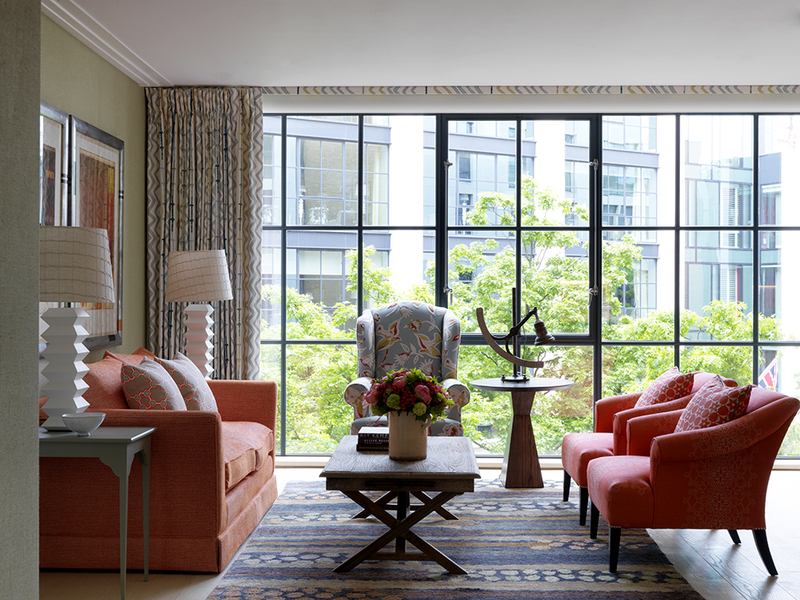 And, of course, each room comes with a signature Firmdale mannequin, which perfectly matches the room décor. Cosy, spacious, ever so comfortable, stylish and a home away from home, there’s a reason Firmale guests keep coming back for more. 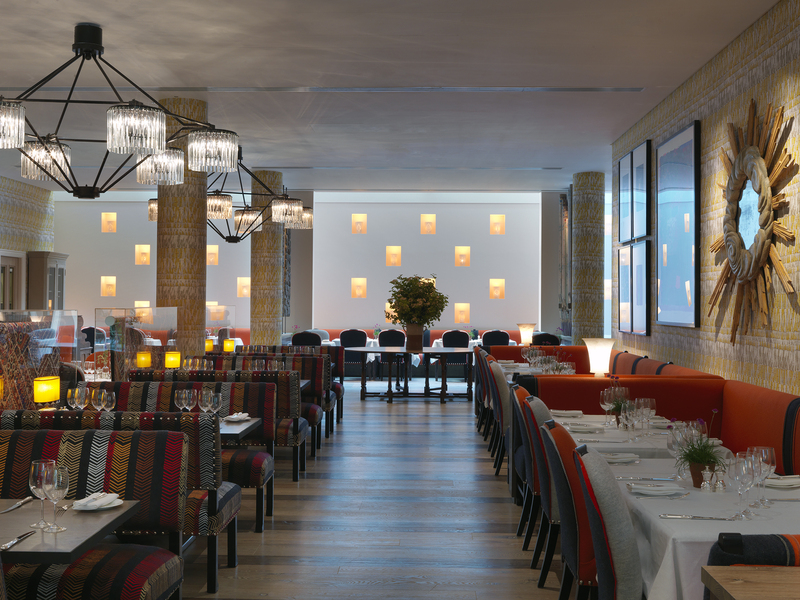 Have you been to Ham Yard yet? What did you think? Do you love the Firmdale brand? I’d love to hear your thoughts on it, and whether you loved it as much as me. P.s I’ve been shortlisted for the ‘Best Travel Blog’ award as part of Cosmopolitan’s 2014 Blog Awards. I need your votes to win! If you like my blog and have a few seconds to spare, please vote for me here (make sure to scroll to the very last page, this is where you’ll find the submit button). Thanking you!